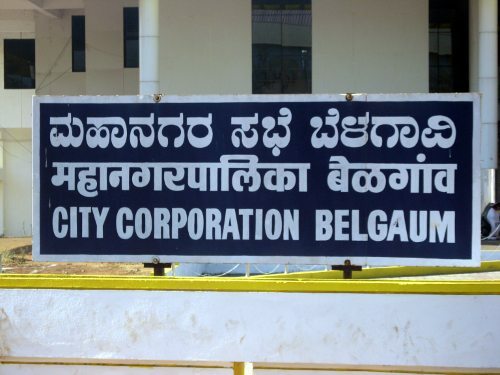 The state government has dissolved the Belgaum city corporation today, Chief Minister D V Sadananda Gowda made a suo moto statement in the assembly stating that the Belgaum corporation has been superseded. The Mayor and Dy.mayor in reply to a notice issued by the urban development minister replied in Kannada and said that they had held meetings and they did not oppose the felicitation of Dr.Kambar. Infact in reality the MES had opposed the resolution but the Mayor in her reply did not mention this. This is the Third dissolution of the corporation, the first was done in 1976 and the second by the Dharam Singh Govt. after the Vijay More incident in 2005. The dissolution has been done under section 99/1 of Karnataka Municipal act 1976 for actions that “offended the sentiments” of people of the state and also that from time to time it did not function as per the KMC act. I don't know why AAB masks some of the posts… ??? Can anyone here EXPLAIN what actually you mean by "DEVELOPMENT"??? Good, and we have you here comenting on AAB, Development is exactly what is opposite of MES.. simple! I THINK INDIA SHOULD ABOLISH PARLIAMENTARY SYSTEM OF ADMINISTRATION. NO MORE ELECTION, NO CORPORATOR, MLA, MP, MINISTER ETC…. THERE WILL BE NO CORRUPTION , NO SCAMS, NO BORDER ISSUE…. EVERYTHING WILL BE "ALL ISS WELL!!!!!!!!!" HOWZZAT????????? Abolish MES first, see developments in ur home town first then think of country! Instead of resolving corporation Karnataka Government should win said corporation and then talk. Belgam is alway belongs to Marathi People and by that of Maharashtra. Sangolli rayanna and Kittur Chennamma, 2 pearls of Belagavi city. Both wer lived almost 200yrs ago. Marati people migrated 50yrs back, to Belagavi. Belagavi is propery of Belgmites. Marati people got Nagpur from MP. Every day not sunday. Belagavi always remains head of karnataka map. Jai Bhuvaneshwari. Gods only knows from where do people get such "historical" references. Really funny man. Belgaum…head of the State………. then what BIDAR, GULBARGA, BIJAPUR already given to Maharashtra & Andhra??? 200 years ago…. 50 years back… Amazing!!!! Even karnatak & MH Govt might not be knowing this fact. Great news… Good bye to these useless corporators..
Good decision by the govt. The govt should not conduct elections to the CCB for at least 2 years. Let the administration be looked after by the DC- a person with brain- and not the rogues. Can the government supersede our MLA's also ? We will have a peaceful and better life in Belgaum. There will be developments, infact much more and faster developments..
All projects and new developments will be under the city corporation commissioner and would be headed by the deputy commissioner of Belgaum. Prasad…So you thought there was development all this while when Corporators where there? They were busy only playing their petty politics and filling their own pockets. Good decision. Appreciable. I request maha govt n shivsena to concentrate on vidharba. Last 1 yr more than 500 farmers suiside cases registered. Save (farmers)backbone of India. Belgaum issue is endless. But one thing sure it will remain part of karnataka only. Very true.. I don’t understand why MES resorts to such petty politics …Instead they can win people’s hearts by doing some development in the city rather then provoking people’s sentiments. let maha govt n shivsena concentrate on vidharba and let Karnatak govt focus of Bellary mining scam and Devegauda, SM Krishna, Kumarswamy, Yedurappa & Company's numerous scam. Govt and political parties here are not able to concentrate on rescuing these scamsters. These Belgaum people are creating hurdles for them.